Toerisme Vlaanderen wil via gerichte promotieactiviteiten naar de Braziliaanse media en reissector Vlaanderen en Brussel bekender maken bij potentiële Braziliaanse bezoekers. Het aantal overnachtingen van Braziliaanse bezoekers steeg de voorbije tien jaar met maar liefst 305%. As of 2018 Visit Flanders signed a partnership agreement with Brussels Airport for 3 years. Brussels airport is determined to do extra efforts for a direct flight from São Paulo to Brussels because they believe in the potential. To show their commitment to the airline companies, we work together on some projects in Brazil focusing on trade. A first project was a beer tasting event. A celebration of our years of efforts in Brazil and welcoming our new partner. The event took place at the Cervejaria Nacional. We invited 120 tour operators, journalists that already travelled to Flanders, our FIT partner and people from airline companies. 70 invitees showed up. 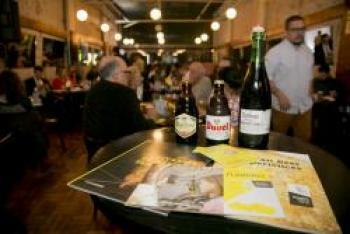 Guests were invited to taste 3 Belgian beers with the explanation of a beer sommelier, in a personalized glass that our guests could take home after the event. We explained how beer is integrated in our culture and our DNA and how it is a reason to come for Brazilian tourists. And just to complete the story, we also had a small partnership with VLAM. They recently started importing Conference peers to Brazil. At the event we served a desert with the peers, also this was highly valued. For the third year in a row Visit Flanders participated in the travel trade show that focuses on an upscale segment in São Paulo. For 3 days, we received 62 travel agents and tour operators. All of them were very interested and excited about selling our destinations. To build confidence in Brazil, it is important to repeatedly participate in the same fair. ITLM (was called Travel Week) has proven to be the best fair in it’s kind in Brazil. And also this year the fair was success. We did make some changes from the learnings we had of the previous years: we compiled a brochure with all DMC’s and tour operators already selling our destination. The first feedback was very positive. We will continue this exercise in the coming years, making sure we can close the gap. Meer cijfers en informatie over de Braziliaanse markt vind je op de kennispagina.